Comic T-Shirt Design commissioned by the Art Gallery of Ontario. "The City of Gears!" exclusive wrap around design depicted various cartoon characters and landmarks from the city of Toronto. Many recognizable faces such as artists, musicians, local celebrities, and regular denizens from the Queen Street West neighborhood were included in the drawing as a sort of pop culture commemoration of downtown TO circa 2008. 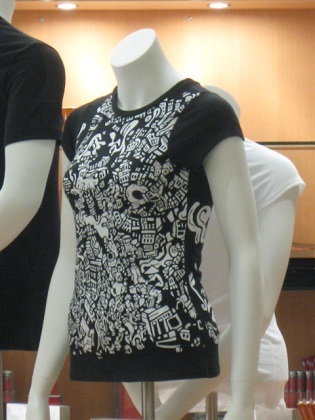 This exclusive top was completely covered with crazy cartoons making it one of the most intricate of all the "HEY APATHY!" fashion designs to date. The work depicts the city as a giant gear propelled by all the people moving through it. The image includes a wide variety of caricatures representative on downtown Toronto at the time. Some notable images were street artists and performers including Chalk Master and Elixer (with the Hug Me tree), the crazy Santa Claus guy ( a local madman who runs around the city wearing red underwear white beard and a Santa Hat ?!) , the mayor and numerous council men as well as several local shop keepers, street vendors, and even a few of the lesser known neighborhood nutcases. At that time I was working regular hours as a street painter right in the middle of the busy Queen Street fashion area and became fairly well acquainted with both our city’s quirky sidewalks and our larger institutions. 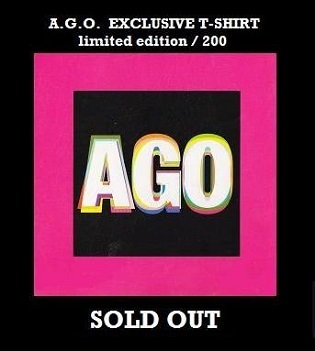 In the fall of 2008 the A.G.O. (Art Gallery of Ontario) celebrated it’s grand re-opening and redesign by architect Frank Gehry. As part of the festivities the museum commissioned 5 Toronto artists to create unique limited edition T-Shirts. The artists were given complete creative freedom using a selection of designer cuts and inks as their artist’s materials. My HEY APATHY! Comic t-shirt was designed as a full wrap around illustration on a short sleeve lady’s cut and printed with heavyset embossed inks. The shirts were limited to editions of 200 and featured during the gala events during the museum’s grand re-opening.